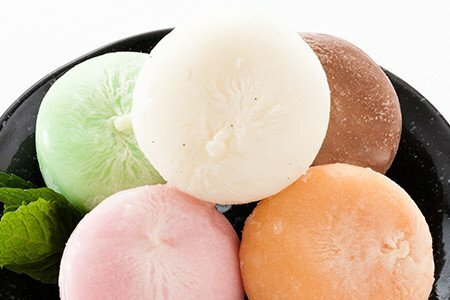 As the original Mochi Ice Cream creator and company, we have been perfecting our mochi recipe for over 105 years. Although we didn’t start filling the doughy centers with ice cream until the 1980s, our family secret mochi dough recipe has been enchanting consumers since long before that. From traditional green tea to modern kona coffee, we have a wide variety of flavors made from premium ingredients. Learn about our delicious Mochi Ice Cream below! Sweet and refreshing, Green Tea Mochi Ice Cream has a light, subtle green tea flavor. Almost bite size, you won’t feel guilty after eating a few. Try a bunch of flavors or savor your favorite one, either way delicious mochi makes the perfect dessert. Add a twist to the traditional earthy flavor of green tea with Green Tea Matcha Mochi Ice Cream. Sweet mochi dough and creamy premium ice cream perfectly balance the duo of unique Japanese flavors. If you’ve ever been to Japan, you’re probably unfamiliar with this traditional flavor. Black Sesame Mochi Ice Cream blends nutty flavors with sweet mochi dough to craft the perfect exotic dessert. Red bean is a traditional Japanese filling that is featured in many desserts other than mochi ice cream. The red bean filling is made with azuki beans and then sweetened to balance out the flavor. Add in premium ice and chewy mochi dough and you’ve created the perfect handheld treat. Reminiscent of plums and peaches, Plum Wine Mochi Ice Cream has a light and fruity flavor. If you’re craving something sweet, this flavor is the way to go. Made with real strawberries, our Strawberry Mochi Ice Cream provides creamy, fruity flavors and sweet chewy mochi dough. The convenient size makes this refreshing treat perfect for snacking. Enjoy a burst of tropical flavors with our Mango Mochi Ice Cream. This bold premium ice cream is perfectly complemented by the mochi dough’s subtle flavors to create a perfect handheld escape. You can’t go wrong with smooth, creamy vanilla. Our Vanilla Mochi Ice Cream expertly blends premium vanilla bean ice cream and mochi dough for a fun and tasty treat. Chocolate lovers won’t be disappointed with our Chocolate Mochi Ice Cream. Decadent chocolate flavors are enhanced with chewy brownie bits spread throughout the ice cream center and cocoa powder dusted on the mochi dough. For the perfect combination of cool refreshment and rich chocolatey flavors, try our Mint Chip Mochi Ice Cream. These ice cream bites will soothe and refresh as they melt in your mouth on even the most hectic days. Cookies ‘n’ Cream is a family favorite. Cookie bits create a tasty twist when you bite into our sweet mochi dough and premium ice cream. Plus, you can take it anywhere for the perfect on-the-go treat. Coffee lovers will find their haven with our delicious Kona Coffee Mochi Ice Cream. Experience a dessert sensation unlike any other when you bite into this sweet treat.